For the past 25 years, it’s been a dream of mine to star in a major motion picture. Cut to now when we find that never happened and it isn’t going to. BUT my second dream was to be in a minor book trailer and that dream hath come true. Thanks to the amazing Ann Leary for masterminding it. She is truly a genius and I’m lucky to call her my friend. Here’s the trailer. ENJOY! This is the first rescue story I’m posting. It’s from Erica Mueller and I cried ten times. Thank you, Erica. This is my late greyhound, Puma. When you have greyhounds, strangers always ask if you rescued them. I explain that virtually all pet greyhounds come from dog tracks because although there are AKC-registered greyhounds, they are few and far between, while many thousands of greyhounds are excessed by the racing industry every year. In fact, I didn’t rescue any of the 7 former racers I have adopted in the last 15 years. They were already safe in adoption kennels. I did save 7 greyhounds, but I’ll never know their names. When I adopted my dogs, it created kennel space so those unknown 7 could reach safe havens, no longer at risk for the needle, bullet, or crowbar because they were injured, or just not fast enough. I used to refer to Puma as my “dumb blonde”. He was dainty and gorgeous, but not the quickest, intellect-wise. He was faster than his “greymate” Dutch, who did have a racing career, but Puma never raced because although he liked to run, he wouldn’t follow the lure. He’d been in a pet home before, but hid in a closet because the husband was abusive to his family. When the wife managed to leave, she was unable to take Puma with her and returned him, at age 3, to the adoption kennel. 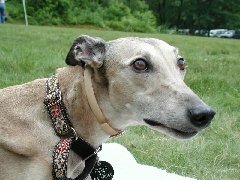 Fast forward to 6 yrs ago, Puma was 12 yrs old, which is about 80-ish in greyhound years. Dutch, his security blanket, had terminal cancer. Knowing how Puma relied on Dutch for reassurance that he was safe, I adopted a third greyhound, 5yr old Rorschach, as soon as I knew Dutch was on borrowed time, so that Puma would not be “alone” once his best friend died. The hound trio got along well, and Puma did not appear to grieve for Dutch, but he wasn’t deeply bonded to Rorschach. Meanwhile, I was diagnosed with cancer, and had major surgery. Before the operation, a dog door was installed because I knew it might be hard to cater to the dog’s toilet needs. There were complications, leading to a prolonged recuperation. In January 2005, about 6 weeks after the operation, we had a sunny, 60-degree day that melted much of the heavy accumulation of snow. I’d been able to keep the stairs leading down to the fenced backyard shoveled, though I wasn’t supposed to exert myself like that. In the middle of the night, Puma scratched at the bedroom door. Before the dog door, he’d only wake me at night if he was going to have diarrhea. Once the dog door was in, he didn’t need to. I told him to go back to sleep but he persisted. I thought he’d either forgotten he could get out on his own, or that the snowshovel on the porch had fallen over and blocked the door. Following Puma, I hobbled weakly to the porch door and turned on the light – at which point he bolted back onto the living room sofa, his favorite bed. It was then that I saw Rorschach at the bottom of the stairs. After the warm weather, the stairs were like glass, the sheet of ice-melt having re-frozen. Rorschach had gone down to the yard, but was unable to get back up. He was standing nearly chest-deep in snow, hypothermic and, as always, too polite to bark. I spread paw-safe ice melt onto the 8 stairs, carefully descending them, and had to lift Rorschach onto the stairs, one leg at a time, half-dragging him by the collar. He was too cold to help much. Had Puma not come to his aid, he would very likely have died by morning. Starting immediately I am inviting YOU to submit stories and photos of your rescued dogs. Each week a team of four legged judges will be selecting a story which will be displayed on the blog (clap, clap, clap). We’re starting with dogs, but we will add other animals later. Your submissions can be sent to JK@JulieKlam.com with RESCUE STORY in the subject line.